J. B. S. Haldane once apocryphally quipped that if there was one thing that could be surmised about any Supreme Deity from available scientific evidence, it was that said Deity possessed an inordinate fondness for beetles (Hutchinson, 1959). This deduction may be understated, as it has been estimated that the order Coleoptera includes somewhere in the neighborhood of a million species (about 2/5 of which have been described as of yet; Foottit & Adler, 2009). This profusion of beetles is subdivided into a quartet of suborders: two (Polyphaga and Adephaga) are speciose; the remainder—Myxophaga and Archostemata—not so much. Archostematans are especially depauperate in terms of diversity: only 42 extant species in 5 families are known (Hörnschemeyer, 2011), which as a whole range from uncommon (Crowson, 1962) to vanishingly rare (the family Crowsoniellidae is known from a single series of specimens; Pace, 1975). Even a person such as myself, who has encountered his share of rare insects, has only happened upon an archostematan once (the cupedid species shown above). Indeed, the Archostemata are far more abundant as fossils than as living beetles. To draw an example from the taxonomic hat, the Ommatidae are currently represented by the genera Omma (with 4 spp. restricted to Australia) and Tetraphalerus (2 spp. restricted to central South America; Beutel et al., 2008): whereas their fossil record (extending back to the early Triassic Period) includes specimens from throughout Eurasia, totaling around 100 species (Tan et al., 2012). The pre-Cenozoic archostematan breadth of morphoecology is congruently impressive: many of the Permian-to-Jurassic Schizophoridae possessed a longitudinal groove delineated along their abdominal margin into which their elytra locked (Rohdendorf et al., 1961), an adaptation indicating an aquatic lifestyle (being moreover herbivorous or carnivorous; Ponomarenko, 2003); other schizophoroids were long-legged dashers in the carabid milieu (Tan et al., 2013) or (in the case of Tricoleidae) bore reticulated, tuberculate elytra: as these are a feature of modern Ommatidae and Cupedidae (the extant Cupedomorpha; Lawrence, 1999), it can be surmised that tricoleid biology was as it is among the modern cupedomorphs—one of dwelling within and feeding upon decayed wood. It has even been speculated that some prehistoric cupedomorphs may have been carnivorous (Jing-Jing et al., 2006), deviating from their contemporary xylomycetophagous norm. Although their present diversity is poor by comparison to its past glory, the disparity of the extant Archostemata is in all fairness not to be sneezed at. Indeed, they are various (even absent the Myxophaga; these were placed within the Archostemata by Ponomarenko, 2002 and Kirejtshuk et al., 2013) to such a degree that the monophyly of the group as presently constituted has been debatable (yet affirmed by multiple studies; Beutel et al., 2008; Hörnschemeyer, 2009; Ge et al., 2010). The suborder was originally defined as restricted to what is now the infraorder Cupedomorpha (Kolbe, 1908): consequently, these are more or less regarded as the archetypal archostematans. Their retention of rib-demarcated elytral cells (vestiges of the veins present in the ancestral beetle's forewings-turned-elytra), shared with the most primeval families of Coleoptera (such as the Tshekardocoleidae: these include what is at c. 298-293 million years old the most ancient of all beetles; Gradstein et al., 2012; Kirejtshuk et al., 2013), is what has earned the Archostemata a reputation as the most primitive of the beetle suborders (although Tshekardocoleidae et al. are phylogenetically exterior to all coleopteran suborders; Beutel et al., 2008). Yet despite their seemingly archaic adult habitus, ommatid and cupedid larval morphology is specialized to such a degree as to resemble unrelated fellow wood-borers among the Polyphaga (Beutel & Hörnschemeyer, 2002a). The remainder of the Archostemata lack the many features that distinguish the Cupedomorpha (among them window-puncture-bearing elytra, transverse mesothoracic ridge, and exposed metatrochantin; Frank et al., 2009): the monotypic (although an additional species is possible; Marshall & Thornton, 1963) Micromalthidae are true to all this; and what with their smooth, shortened elytra and length of only a few millimeters, they bear not the slightest resemblance to cupedomorphs. Micromalthus debilis was repeatedly placed within the Polyphaga, whether of proposed cantharoid (Arnett, 1968) or lymexyloid affinity (Jeannel & Paulian, 1949; Barlet, 1996), or within the Lymexylidae itself (LeConte, 1878; Hubbard, 1878): their archostematan affinity is now certain (Beutel & Hörnschemeyer, 2002b). "Telephone-pole beetles" make their paleontological debut only in the Cretaceous Period (Crowson, 1981) (all specimens from prehistoric eons representing the single extant species; Hörnschemeyer et al., 2010), although their fragility and diminution would largely preclude their fossilization regardless of the family's age. A few of these amber-preserved fossils hail from well beyond telephone-pole beetles' modern North American range (Crowson, 1981; Lawrence, 1991; Lawrence & Newton, 1995). But the most interesting aspect of M. debilis would be its ontogeny, to which multitudes of coleopterists have attached all manner of superlatives: I'll just say here that God gives all appearances of having been stoned off His bum when He created the telephone-pole beetle. The exceedingly confusing life cycle of this creature has been summarized in the flowchart shown at left, created by Heath Blackmon; according to him, it is most sensible to consider the tangled affair beginning with the triungulin larvae, which are universally female and conceived parthenogenetically: these moult into a cerambycoid larva in which the ovaries begin to mature, subsequently either undergoing pupation into adults or moulting into larvae with fully mature ovaries, enabling them to a) parthenogentically lay eggs which hatch into the aforementioned triungulins or b) arrhenotokously conceive eggs (Scott, 1938) which hatch into curculionoid male larvae (remaining attached to their mother until they do so), which mature fully into adult males that copulate with adult females, fathering triungulin daughters. I should note here that it is presumed that the adult M. debilis (which are scarce representatives of their species) reproduce sexually: some coleopterists have hypothesized that these males do not mate at all (Smith, 1971; White, 1973), and are thus in essence useless. This seems unlikely, since female reproductive larvae are penalized severely for bearing sons: males (always lone) hatch, invariably plunge into their mother, and, as Christopher Taylor put it, "eat mum from the inside out". Hence it makes little sense that males would be utterly without function (Pollock & Normark, 2002). In terms of their prolonged presence in the fossil record, telephone-pole beetles are undoubtedly antiquated: yet they are hardly archaic; nor are they alone in this state of specialization. The tiny Crowsoniella relicta lacks many of the same traits that are found in the remaining archostematans, but are absent from micromalthids—their metepisterna do not adjoin the metacoxal cavities, nor do they possess prothoracic sutures (Barlet, 1996; Kirejtshuk et al., 2010), bearing almost no apparent kinship to the ommatids among which this species was initially classified (Lawrence & Newton, 1982). Consequently, the Crowsoniellidae (just as were the similarly monotypic Micromalthidae) have been purported to belong in Polyphaga (Kirejtshuk et al., 2010). But since the argument for this position can be reduced to the following exchange—"How do you know this beetle is a polyphagan?" "It looks like one!" (Ge et al., 2010)—it holds little water. Of course, the fact that all C. relicta were collected in soil samples drawn from the base of a single Italian chestnut tree (and have never been collected since) means that its taxonomy must be guessed at without recourse to evidence from larval morphology, molecular genetics, or biological data; but on the basis of known characteristics, it appears that crowsoniellids are indeed derived archostematans (Crowson, 1975; Lawrence, 1982; Beutel et al., 2008; Hörnschemeyer, 2009). So far, all the archostematans examined herein have failed to live up to their suborder's reputation as the most archaic within the Coleoptera; and the family with which I conclude (the Jurodidae) are not wholly dissimilar from them. They put one in mind of the crowsoniellids in terms of their exceptional rarity: the only extant species is known from but a single specimen (shown at left) collected in the Sikhote-Alin cordillera of Russia's Maritime Province (Lafer, 1996). They are, nevertheless, indubitably ancient: the Transbaikalian fossils from which they were first described potentially date to as old as ~175 m.y.a. (Gradstein et al., 2012). Jurodids present a confusing mosaic of traits: their enlarged coxae suggested that they should be placed within the Adephaga (Ponomarenko, 1985); whilst the discovery of the extant S. zhiltzovae (and additional fossil remains of Jurodes) revealed features that indicated an archostematan identity (Kirejtshuk, 1999) along with wing venation resembling that of the polyphagan superfamilies Scirtoidea and Scarabaeoidea (Fedorenko, 2009). Comparisons were therefore even drawn to the Derodontidae (which were later demonstrated as superficial; Ge et al., 2007; Yan et al., 2014), leading to the outright placement of S. zhiltzovae in the Polyphaga (Lafer, 1996). Strangest of all, though, is their possession of an ocellar triad on the head (Yan et al., 2014). Ocelli are absent in all other beetles (Leschen & Beutel, 2004) with the exception of a teratological omaliine rove beetle (Staphylinidae) (Naomi, 1987): even the Tshekardocoleidae lacked these light-sensing ommatidia (Ponomarenko, 2002). As a result, Jurodidae have been placed as the sister-group to the remaining Archostemata (Hörnschemeyer, 2005; Beutel et al., 2008). Considering this phylogeny, notable atavism, and the fact that the Jurodidae have hardly changed since the mid-Jurassic (Yan et al., 2013) we can rightfully call them beetles that time forgot. Arnett, R. H. (1968). The Beetles of the United States. Ann Arbor: American Entomological Institute. Barlet, J. (1996). 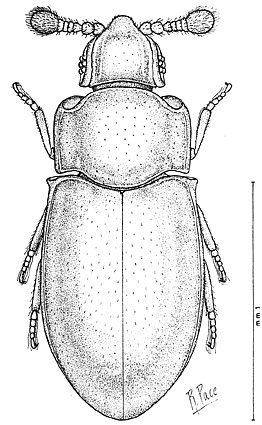 Quelques précisions au sujet de Micromalthus (Insecta Coleoptera). Bulletin de la Société Royale des Sciences de Liège, 65, 373-378. Beutel, R. G. and Hörnschemeyer, T. (2002a). Description of the larva of Rhipsideigma raffrayi (Coleoptera, Archostemata), with phylogenetic and functional implications. European Journal of Entomology, 99, 53-66. Crowson, R. A. (1962). Observations on the beetle family Cupedidae, with the descriptions of two new fossil forms and a key to the recent genera. Annals of the Magazine of Natural History, 5, 147-157. Crowson, R. A. (1975). The systematic position and implications of Crowsoniella. Bolletino del Museu Civico di Storia Naturale di Verona, 2, 459-463. Crowson, R. A. (1981). The Biology of Coleoptera. London: Academic Press. Fedorenko, D. N. (2009). Evolution of the Beetle Hind Wing, with Special Reference to Folding (Insecta: Coleoptera). Sofia-Moscow: Pensoft Publishers. Foottit, R. G. and Adler, P. H. (2009). Insect Biodiversity: Science and Society. Hoboken: Wiley-Blackwell. Ge, S.-Q. ; Beutel, R. G.; and Yang, X. K. (2007). Thoracic morphology of adults of Derodontidae and Nosodendridae and its phylogenetic implications (Coleoptera). Systematic Entomology, 32, 635-667. Gradstein, F. M.; Ogg, J. G.; Schmitz, M.; and Ogg, G. (2012). A Geologic Time Scale 2012. Amsterdam: Elsevier B.V.
Hörnschemeyer, T. (2005). Archostemata Kolbe, 1908. In Kristensen, N. P. and Beutel, R. G. (eds. ): Coleoptera, Vol. 1. Morphology and Systematics (Archostemata, Adephaga, Myxophaga, Polyphaga Partim). Handbook of Zoology Vol. IV, Arthropoda: Insecta (pp. 157-182). Berlin-New York: De Gruyter. Hubbard, H. G. (1878). Description of the larva of Micromalthus debilis LeC. Proceedings of the American Philosophical Society, 17, 666-668. Jeannel, R. and Paulian, R. (1949). Les coleóptères. Grassè, P-P. (ed. ): Traité de Zoologie, 771-1,077. Paris: Masson. Kolbe, H. (1908). Mein System der Coleopteren. Zeitschrift für Wissenschaftliche Insekten-Biologie, 4, 116-123, 153-162, 219-226, 246-251, 286-294, 389-400. Kirejtshuk, A. G. (1999). 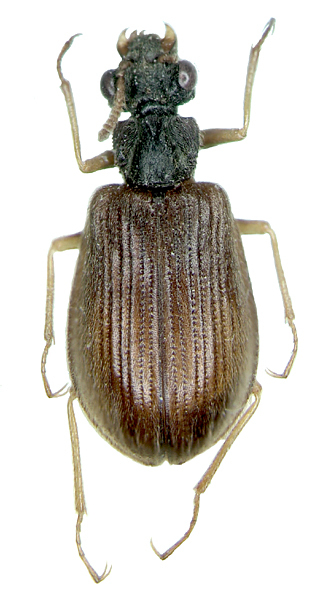 Sikhotealinia zhiltzovae Lafer, 1996—recent representative of the Jurassic coleopterous fauna (Coleoptera, Archostemata, Jurodidae). Proceedings of the Zoological Institute RAS, 281, 21-26. Kirejtshuk, A. G.; Nel, A.; and Collomb, F.-M. (2010). New Archostemata (Insecta: Coleoptera) from the French Paleocene and Early Eocene, with a note on the composition of the suborder. Annales de la Société Entomologique de France, (n.s. ); 46, 216-227. Lafer, G. S. (1996). Family Sikhotealiniidae. In Ler, P. A. (ed. ): Key to the Insects of the Russian Far East, vol. III, pt. 3 (pp. 390-396). Vladivostok: Dal'nauka. Lawrence, J. F. (1982). Coleoptera. Parker, S. (ed. ): Synopsis and Classification of Living Organisms (pp. 482-553). New York: McGraw-Hill. Lawrence, J. F. (1991). Ommatidae (=Ommadidae, including Tetraphaleridae), Cupedidae (Archostemata) (=Cupesidae), Micromalthidae (Archostemata), Buprestidae (Buprestoidea) (incl. 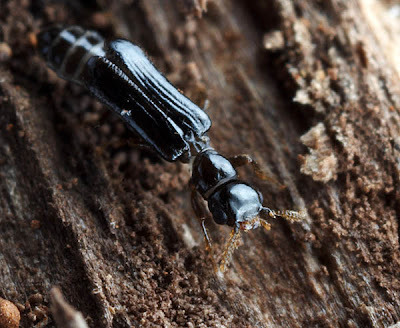 Schizopodidae), Zopheridae (Tenebrionoidea) (including Merycidae). Cerambycidae (Chrysomeloidea) (including Disteniidae, Hypocephalidae, Oxypeltidae, Parandridae, Spondylidae, Vesperiidae). Stehr, F. W. (ed. ): Immature Insects, vol. 2 (pp. 298-302, 386-388, 518-519, 556-561). Dubuque: Kendall/Hunt Publishing Co.
Lawrence, J. F. (1999). The Australian Ommatidae (Coleoptera: Archostemata): new species, larva and discussion of relationships. Invertebrate Taxonomy, 13, 369-390. Lawrence, J. F. and Newton, A. F. (1982). Evolution and classification of beetles. Annual Review of Technology and Systematics, 13, 261-290. Lawrence, J. F. and Newton, A. F. (1995). Families and subfamilies of Coleoptera. In Pakaluk, J. and Slipinski, S. A. (eds. ): Biology, Phylogeny & Classification of Coleoptera; vol. 1 (pp. 779-1,006). Warszawa: Muzeum i Institut Zoologii PAN. LeConte, J. L. (1878). The Coleoptera of Michigan. Proceedings of the American Philosophical Society, 17, 613. Leschen, R. A. B. and Beutel, R. G. (2004). Ocellar atavism in Coleoptera: plesiomorphy or apomorphy? Journal of Zoological Systematics and Evolutionary Research, 42, 63-69. Marshall, A. T. and Thornton, I. W. B. (1963). Micromalthus (Coleoptera: Micromalthidae) in Hong Kong. Pacific Insects, 5, 715-720. Naomi, S. I. (1987). Comparative morphology of the Staphylinidae and allied groups (Coleoptera, Staphylinoidea). Japanese Journal of Entomology, 55, 450-458. Pace, R. (1975). An exceptional endogeous beetle: Crowsoniella relicta n. gen. n. sp. of Archostemata Tetraphaleridae from central Italy. Bolletino del Museo Civico di Storia Naturale, Verona; 2, 445-458. Ponomarenko, A. G. (1985). Coleoptera. In Rasnitsyn, A. P. (ed. ): Jurassic Insects of Siberia and Mongolia (pp. 47-87). Moscow: Nauka. Ponomarenko, A. G. (2002). Beetles. Scarabaeida. In Rasnitsyn, A. P. (ed. ): Late Mesozoic Insects of Eastern Transbaikalia (pp. 164-176). Moscow: Nauka. Rohdendorf, B. B.; Becker-Migdisova, E. E.; Martynova, O. M.; and Sharov, A. G. (1961). Paleozoic insects of Kuznetsky Basin. Trudy Palaeontologicheskogo Instituta AN SSSR, 85, 412-463. Scott, A. C. (1938). Paedogenesis in the Coleoptera. Zeitschrift Morphologie Ökologie Tiere, 33, 633-653. Smith, S. G. (1971). Parthenogenesis and polyploidy in beetles. American Zoology, 11, 341-349. White, M. J. D. (1973). Animal Cytology and Evolution (3rd. ed.). Cambridge: Cambridge University Press.